So the story goes that the score of Bach's violin Sonatas and Partitas almost became the meat-wrapping material of choice for a butcher in Koethen. Dmitri Makhtin is the latest to join a long line of violinists eager to pick up their violin and show us an alternative use of the manuscript. Indeed, this particular score has come a long way since its fortuitous rescue from the butcher shop. These days, a performance, let alone a recording, of Bach's solo violin works is a milestone in any violinist's career. Nor does Makhtin make things easier for himself: this recording venture is his very first one as a soloist, and one that marks a neat departure from the romantic repertoire he chose as a chamber musician. This is a very brave move from a performer still very much in the early years of his development. 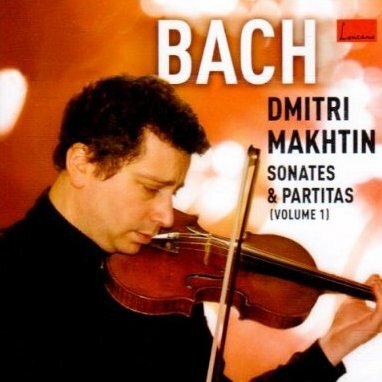 On top of this, Makhtin manages to snub the two big stereotypes of baroque performance by avoiding an overly emphatic performance or a painstakingly historically informed one. So what we are left with is an accomplished, yet fuss-free recording. Even a little too fuss-free. The proud, ornate opening of the G minor Sonata (BWV 1001) simply flows, not indulging in histrionic hesitations or diminuendi when rounding off phrases, not insisting on making every multiple stop plangent. Likewise the famous Fugue that follows it is admirable in its rhythmic control, and the little Siciliana is suitably quaint. Yet an exception to Makhtin's resolve not to rush his tempi could have been made for the closing Presto: as it is, we are one speed-notch away from being swept off our feet. The large B minor Partita (BWV 1002) takes up the central section of the album. Makhtin misses out on the untapped potential of the opening Allemanda: those hollow open fifths and octaves, regularly piercing the rich harmonic fabric, could have made us stop dead in our tracks, and didn't. And a little more risk could have been taken with the speed of the Sarabanda, whose tempo was still too flowing to create contrast with the Courante, but the razor-sharp Bourree was a real pick-me up. The alternating doubles — small numbers of motum perpetuum unravelling their matching movements into a constant melodic stream — all shared that artless, flowing quality with which Makhtin seems to be most comfortable. The A minor Sonata (BWV 1003) opens with a splendid Grave. Again only wishes that the exquisitely uncanny ending — a chromatically rising minor sixth leading to open octave Es — could have lingered a few moments longer. After the towering fugal movement, a moment's rest is offered by the Andante, with the pseudo-continuo in the lower register admirably brought out. But the closing Allegro, with its vivaldian alternation of forte and piano sections, was unforgivably lacking in dynamic contrast. The promising simplicity of Makhtin's playing comes with a tendency to shy away from the risks that can make or break a performance. Yet one must stop short of simply blaming the performer. More than twenty recordings of the Bach violin solo works have been brought out in the last ten years alone: we are reaching a saturation point. New talent like Makhtin's could truly shine by straying off the beaten path a little. And after all, this is only the first instalment of Makhtin's so far valid, though not striking, addition to the range of performances of these much-loved works. And we have no reason not to look forward to the next chapter.